We have all faced the same depressing situation, be it a college assignment, a business presentation or addressing people at social gatherings. Public speaking ranks high in the list of things that we hate. In fact, many people suffer from acute stage fright. Yet, the simple fact is that you cannot progress in your profession if you cannot speak effectively. If you are not habituated to giving public speeches, then you are likely to suffer from sweating palms and trembling knees. But in order to get the best out of relationship, you need to enhance your speaking skills till you are in perfect control. The clearer perception you have about the topic you are speaking, the less likely are you to falter while giving the speech. If you have sufficient time, select a topic which you know about or have deep interest in, so that you can make a good start. Don’t get anxious if you cannot pick up a topic. Having a good knowledge of the material will enable you to speak with confidence. The internet can provide you with a good deal of information on the details related to the topic. Spend more time researching on the topic. You will thus be able to create a great impression on your audience. Find out about the exact type of audience before whom you are going to speak. Spend some time researching on this. Make phone calls beforehand to learn about the group to whom you will be speaking. By doing so, you will be able to speak eloquently according to their perception, understanding and interest. Once you know well about the subject, practice your speech as much as you can. You can speak in front of the mirror or in front of your associates. Follow the method that is easier for you. Practice will help you to get a perfect idea about what the actual length of your speech is, and where you need to make the changes. Moreover, speaking loudly a number of times will make you feel acquainted with your speech on the day of the event. Being comfortable with your speech is essential if you would like to avoid sounds like ‘’umm’’ and other types of pauses. If you are speaking in front of your friend, see where they show greater interest and also find out where they light up. Also notice the sections where you feel uncomfortable or awkward and work on them to make your speech appear more natural. The greater delay your preparation for the speech, the greater will be your anxiety. Therefore, don’t wait for the last minute if you wish to avoid panic. Prepare the speech well in advance. Look for ideas and collect them a week or even a month before the speech. No matter what happens in your professional or personal life, always look for a good story which you can use to explain a point-from the time you almost gave up… to how you won a huge contract. Take time to read everything, from books, newspapers and magazines to gather valuable information that you can use to make the speech. It will help you to create an instant impression. Try to intermingle with the audience before the start of the event. Shake hands with them and chat with them for some time. You will feel more comfortable when you stand in front of them. If you feel nervous while speaking in public, then a warm, familiar smile from someone among the audience will help you to get rid of your fright. This will make all the difference. This tip will help you especially when you speak in front of strangers and therefore, you try to have some familiar faces to focus on while speaking. One way to minimise pre-speech nervousness is to arrive at the venue early. Get familiar with the space and make sure that the AV and visual aid equipment are in perfect working condition. Most often, speakers waste their energy worrying about uncertain technical difficulties. Checking everything will make sure that you don’t face technical difficulties while speaking. You will also get another opportunity to practice your material once or multiple times. As soon as you can, try to create a chemistry with your audience. Start the speech with an example, story or something that attracts their attention right at the start. But keep one thing in mind. If you are not good at joking, then stay within your limits and respect your audience. Ask the audience some question. Present a problem. Rather than giving a constant speech, try to involve your audience from time to time by asking one question after another. Make sure that you do not lose control. Use examples that are relevant to the audience. Start your speech by welcoming your audience, and if possible with a witty joke or story. Starting the speech in an informal manner will provide you with the opportunity to calm your nerves and to be comfortable. Moreover, you will also feel more relaxed while discussing about a topic in a conversational tone, acquiring an opportunity to have complete command over your speech. Moreover, by grabbing the audience’ attention first, you can help to strike a chord with the audience present at the venue. They will hear you with a great deal of attention. The greater success of an orator lies in attracting complete attention of the audience. Make sure that there is a beginning, middle and end to your speech. Following the ‘’radio writing rule’’ will prove to be highly useful. Tell them what you are going to speak about at the beginning, then speak about it and then complete it with a proper conclusion at the end. People like speakers who present their thoughts in an organised fashion. Actors are always encouraged to act naturally-no matter what role they may be playing. Apply this rule to yourself while giving your speech. Keep one thing in mind, they came to see you and not a dummy which resembles you. So make sure, you be yourself. Most people may dismiss this, however visualization is a technique which is used by successful people from different parts of the world,from entrepreneurs to athletes, while speaking publicly. Visualize the picture of yourself giving a rousing speech in front of thousands of people. This will make you feel confident about your address. It will help you to get over nervousness and is a suitable way for you to impart the knowledge that you have. Performing some methods of relaxation is a must before you start, even if you are an experienced public speaker. No one wants to listen to someone who lacks confidence and is uncomfortable, even if what they are saying is useful. 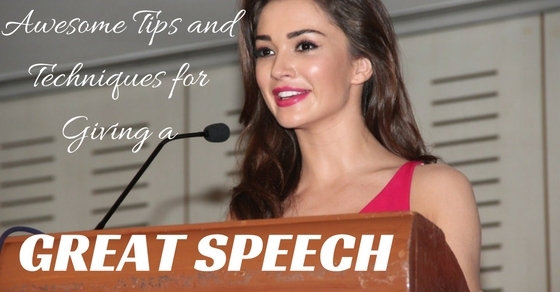 Taking a deep breath before the speech can in a great way help in making you look more natural. Last but not the least, even if you are so nervous that your knees are shaking, try to show confidence while speaking. Use proper eye contact. If you speak with clarity and gesture normally, you tend to look more relaxed. Even if you feel uncomfortable, speaking on your topic with confidence will attract the desire of your audience to speak to you. If there is a flaw with the equipment or you say something wrong, laugh it off and continue. The audience will tend to ignore imperfections if you tend to ignore them as well. Rather than memorising your speech, create a number of ‘’sign-posts’’-stories which you intend to speak on. By doing so, your speech will appear more natural to the listeners and you will be able to broaden and expand at each point. Creating slides which outline your talk is a great way to maintain the flow of your speech and keep you natural. But don’t hesitate using slides. Making slides does not require too much of technical knowledge. Slides are always reliable and can be easily updated. Enable your audience to hear you and feel how you are not flawless at all. People around the world can identify with speakers who are imperfect because no one is perfect. Tell them about the mistakes which you have made in the past. Also speak about what you learned from those mistakes. Tell your audience, why you are standing in front of them today- to share what you know and help them avoid making similar mistakes. It will not only reveal your humility, but also help you create a credible, trustworthy image. The audience will ask for nothing more and follow each point that you speak with a good deal of attention. As a result, your popularity as a speaker will increase considerably and help you gain fame instantly.